Our representatives will receive you and transfer to Madurai hotel after fresh n up visit Meenakshi Temple and overnight stay at hotel. After breakfast drive to Rameshwaram on arrival check in at hotel after fresh up n up visit. 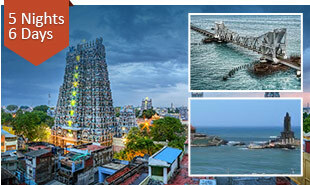 Hanuman Temple (24 ft.)Pamban Bridge, Navpanigriham, KashiVishwanatha Temple, 24 Kundalas, Ram Paravath, SitaParavath, Hanuman Paravath, Vishnu Temple.etc. Overnight at hotel. After breakfast checks out from Hotel and drive to Kanyakumari on arrival Kanyakumari visit Gandhi Memorial, Vivekananda Rock, Devikanya temple and overnight at hotel. After breakfast transfer to Kovalam on arrival check in at hotel, after fresh n up free to enjoy on beaches on Kovalam. Overnight stay at hotel. After breakfast, transfer to Kovalam sightseeing of PadhamanabhaSwamy temple, Museum, Horse Palace, Art Gallery. Kovalam considered as the Paradise of the South. It consists of three adjacent crescent beaches and also picture perfect tropical beaches. Overnight at hotel. 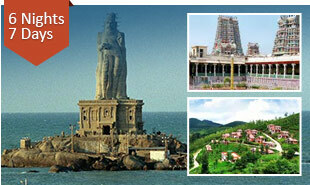 Our representatives will receive you and transfer to Madurai hotel and overnight stay at hotel. After breakfast transfer to Kodaikanal by road on arrival check in at hotel, after fresh n up later visit Kodaikanal Lake, spread over an area of 60 acres and surrounded by wooded slopes. The attractive walk around the lake takes between one and a half hours. Additionally, you have the option of boating or fishing on direct payment basis. In and around Kodaikanal to visit Cocker’s Walk, Golf Links, Green Valley View, Pillar Rocks, Silver Cascade Falls, Bear Shola Falls etc. Overnight stay at Kodaikanal. After breakfast transfer to Madurai on arrival check in at hotel, after fresh n up visit Meenakshi Temple & some local points overnight at hotel. After breakfast transfer to Rameshwaram Hanuman Temple (24 ft.) Pamban Bridge, Navpanigriham, KashiVishwanatha Temple, 24 Kundalas, Ram Paravath, Evening return back to Madurai hotel & overnight at hotel. 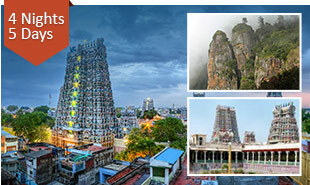 After breakfast transfer to Kodaikanal on arrival check in at hotel after fresh n up visit local sightseeing of Kodaikanal & overnight at hotel. After breakfast, later visits of Kodaikanal Lake, spread over an area of 60 acres and surrounded by wooded slopes. The attractive walk around the lake takes between one and a half hours. Additionally, you have the option of boating or fishing on direct payment bsis. In and around Kodaikanal to visit Cocker’s Walk, Golf Links, Green Valley View, Pillar Rocks, Silver Cascade Falls, Bear Shola Falls etc. Overnight stay at Kodaikanal. Early morning after breakfast we proceed to Ooty reach Ooty and check in at hotel. 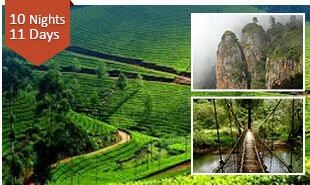 Later proceed for sightseeing which includes Ooty lake, Botanical Gardens, DoddaBetta, Ooty Lake etc. (boat ride on direct payment basis) Overnight stay at Ooty. Today you will proceed to Conoor to look from close quarter the Tea Gardens, Sim’s Park, Dolphin’s Nose l Kalhatty Waterfall. Later back to Ooty visiting Film shooting points.Overnight stay at Ooty. Day 07: Ooty to Coimbatore Airport for further destination. After breakfast transfer to Coorg by road on arrival check in at hotel, evening free for personal activities & overnight stay at hotel. After breakfast proceed for an exciting sightseeing tour of Coorg.Kodagu or Coorg, known as the ‘Scotland of India’, is the most picturesque hill station of Karnataka. Located on the Western Ghats at an altitude of 4000 ft, Kodagu has dense forests, coffee and tea plantations, orange orchards and lush paddy fields dotting its terrain. The majority of the population here belongs to the Kodava community; an ancient martial race with distinct culture and traditions. The people of Kodagu are considered the most beautiful of the people in India. Overnight stay at hotel. Morning pick you up from your preferred place and proceed for Mysore. 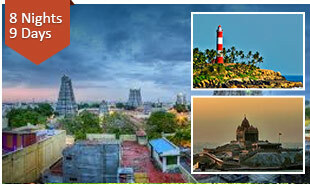 you can begin your tour by visiting - Mysore Palace, zoo &Chamundi Hill. Silk and Sandalwood are two specialties of Mysore. Enjoy sound and light show in Brindavan Garden and also visit Krishnarajasagar Dam in evening. Overnight at hotel. After breakfast drive to Bangalore. (240 Kms / 6 Hrs).On arrival check in into hotel. After freshup visit VidhanSoudha, Lalbagh Botanical garden, Tipu Sultan’s palace and Bull temple – one of the oldest temples built in 16th century. Overnight at the hotel. Morning after early breakfast, drive to Alleppey on arrival check in at hotel after fresh n up visit local sightseeing point, Evening free to enjoy boat ride on lake. Overnight at hotel. After breakfast we take you for a full day sightseeing trip of Munnar – covering some of the major sightseeing - Mattupetty Lake & Dam, Echo Point, Kundale Lake, Blossom Garden, Rajamalai, Eravikulam Wildlife sanctuary home of NilgiryThar (very rare mountain goat), considering the ecological faunal, floral, geo- morphological and zoological significant & Tea Plantation & Tea Plantation. Overnight stay in Hotel, Munnar. After breakfast drive to Cochin Airport for further destination. 2. TOLL TAX, STATE TAX.